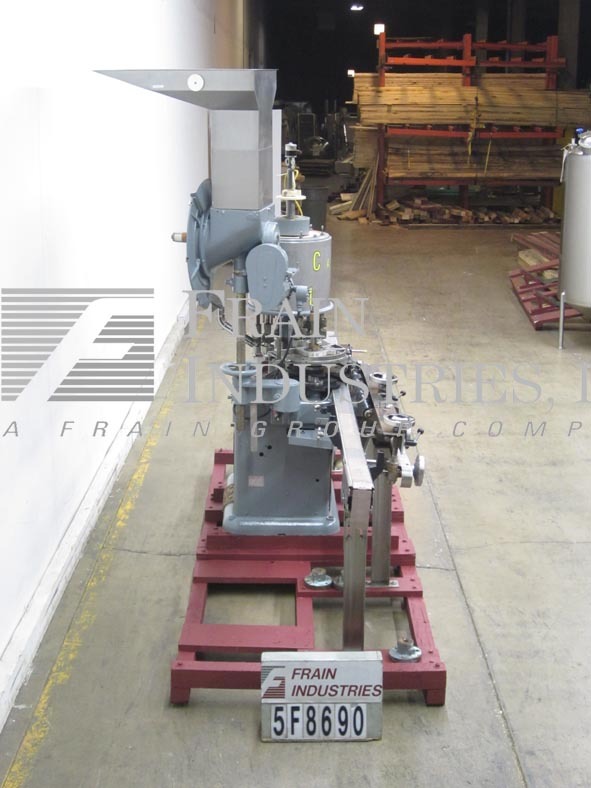 Consolidated Model D6F, automatic, 6 head rotary chuck capper rated from 24 to 180 containers per minute – depending on materials and application. Cap size: up to 100mm. Container Size: up to 5" in Diameter (with proper change parts). Equipped with cap hopper, disc cap sorter, feed chute with cap pick off . 96" long x 2-1/4" wide container conveyor with 32" long worm screw in feed to star wheel discharge, no container / no cap, rotary turret with (6) torque open chucks with turret safety guarding. mounted on heavy duty base frame. The Alcoa 212-6 Is An 6 Head, Fully Automatic, Rotary Capper Designed To Apply Plastic Caps To Glass Or Plastic Containers. Rated to speeds from 120 to 300 caps a minute – speeds depending on container and caps. Rotary capper is capable of speeds from 60 to 180 cpm – speeds depending on materials and application. Change over done in 50 min. Has air control chucks with air torque control. Unit has 3A adjustable cap feeder, 5.5 cuft supply hopper which also handles 15 – 89 mm cap range. and change parts for 110mm also available. One set included w/machine. 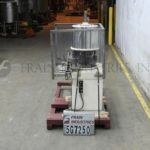 GWC PRICE INCLUDES: Capper in good working condition set to one size subject to inspection of samples. 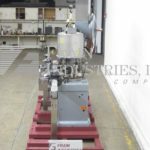 Consolidated Model D6-F, automatic, 6 head rotary chuck capper rated from 24 to 180 containers per minute – depending on materials and application. Cap size: up to 100mm. Container Size: up to 5" in Diameter both with proper change parts. 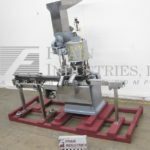 Equipped with 150" long x 3¼" wide container conveyor with 24" long worm screw to star wheel container indexing, cap hopper, disc cap sorter, feed chute, cap pick off, no container / no cap, 16" OD rotary turret with safety guarding, double container grippers and (6) torque open chucks set on 8" centers. Controller has start, stop, e-stop push buttons with elevator and cap auto, off, manual control switches, counter and statis light bar Mounted on heavy duty base frame. 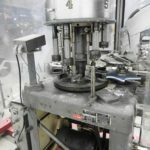 Consoildated, 6 Head rotary chuck capper rated from 60 to 175 containers per minute – depending on materials and application. Cap size: up to 70mm / Container size: up to 5" diameter – with proper change parts. Equipped with 3" wide by 47" long cap conveyor, 3½" wide x 81" long container conveyor, star wheel in feed and discharge, container body clamps, (6) cap chucks, and interlocked safety guarding. Change parts required to accommodate size range of container and cap. 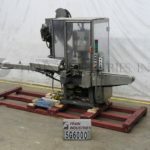 Consolidated Model D6FA, automatic 6 head rotary chuck capper rated from 24 to 180 containers per minute – depending on materials and application. Cap size: up to 70mm and Container Size: up to 5" in Diameter (with proper change parts). Equipped with cap sorting feeding with feed chute, cap pick in place, 72" long container infeed conveyor with a 32" long timing screw, star wheel, container clamps, no container cap discharge chute, star wheel discharge, and a 36" long discharge conveyor. 6 Head rotary chuck capper rated from 60 to 180 cpm – speeds depending on materials and application. Cap size range: 15mm to 89mm. 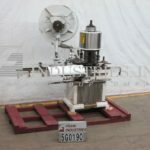 Equipped with 4" wide by 108" long conveyor, screw to star wheel in feed and discharge, container body clamps, integrated rotary disc cap feeder, cap shoot, cap transfer, six cap chucks, no bottle / no cap and interlocked safety guarding. Change parts required to accommodate size range of container and cap.